Plastic Vermi Composting bin: ideal for garden if small size, and ideal for bungalows and Societies if large size. Light weight bins, which can be divided into two halves (if required). Portable and easy to clean. 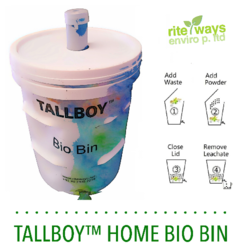 · Ideal for composting in flats, apartments and institutions etc. · Outdoor product, for use on terrace or outdoor location. We bring forth our vast industrial experience and expertise in this business, involved in providing Composting Bin.